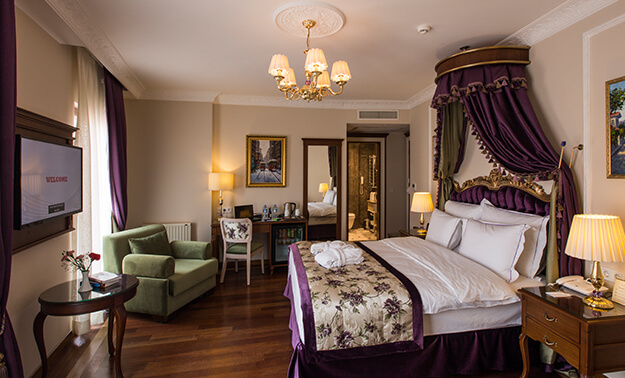 GLK PREMIER Sea Mansion Suites & Spa is located in Historical Peninsula which is in the middle of Sultanahmet, Old City and facing the Marmara Sea Princess Islands and Bucaleon Palace Ruins on shore of magical Bosphorus. When you pass through the doors of this luxury mansion, you will be welcomed by the peerless beauty that makes GLK PREMIER Sea Mansion Suites & Spa charming in rooms or suites and other facilities. 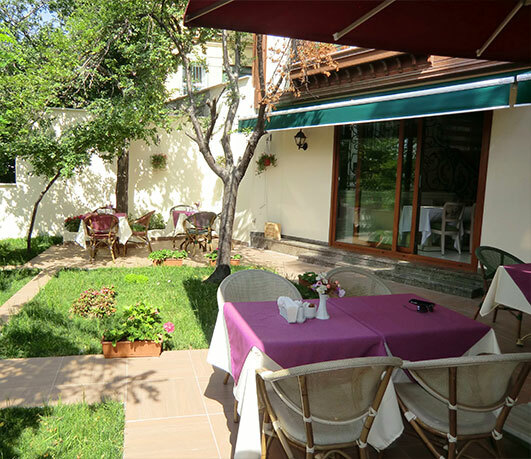 Enjoy your breakfast and sunset in Garden of Eden which is equipped with plum trees and kinds of flowers facing to the Marmara Sea and Princess Islands. Relieve your tiredness using Turkish Hammam and Sauna in SPA center. If you would like our professional masseurs are ready to accompany you. Keep your body energic in fitness room. Experience the perfect blend of modern amenities and historical inspires by professional management mentality and GLK GROUP quality. 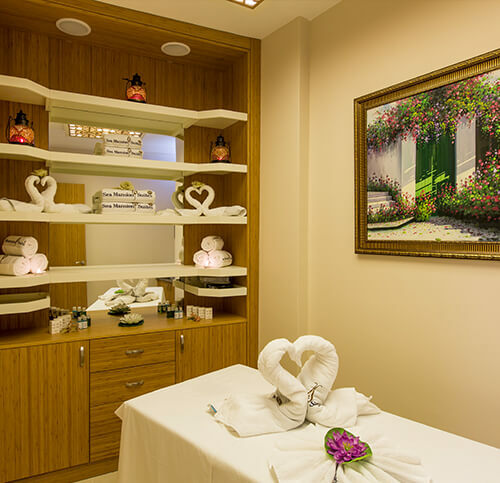 Enjoy your time and relieve your tiredness in our exclusively usage SPA center. Feel the relaxing of your body in Turkish Hammam and Sauna which serves complimentary. My family and I traveled to Istanbul on a whim. This hotel was a gem - a great find. Immediately upon reaching the hotel, we were greeted by the staff who helped bring our luggage to our room. Throughout the trip the staff was courteous, genuinely caring, and helpful. The breakfast provided was delicious and there was plenty of selection. The room was lovely and clean. Murat and Anil were extremely kind and helpful regarding various aspects of our trip like where to go and what to eat. We were even given umbrellas to borrow! The location of this hotel is spectacular. It's a walking distance away from the Blue Mosque, Hagia Sophia, and great restaurants. This place went above and beyond our expectations. We loved our stay and highly recommend this place to any traveler! Pros: Location, tasty food and excellent service Cons: No individual climate control, it's only central controlled. Location: Blue Mosque, Hagia Sofia and bazaar are right around the corner. Lots of restaurants nearby The hotel is about 5min walk from the Blue Mosque & Hagia Sofia, if you take a few steps out from the hotel you'll see them right away. It's definitely closer than it looks on the map and also very in a quite area. The owner and all their staff are very kind and friendly, they treat guests like family and very helpful on planning a city tour. You can also book tourist tour at the hotel and they don't charge you for booking fee or anything. Me and my friend booked half day boat + cable car tour and we really enjoyed it. I stayed at a junior suite and the room was slightly smaller than I expected but it was very well maintained, clean and the bathroom was very nice. (Bathtub has a jacuzzi, very nice.) The breakfast was amazing, lots of variety and all were very tasty. If you don't have enough time to go to Hamam in town, try the hotel's one. They have small sauna and hamam, it's nice and free for hotel guests. I would definitely stay here again if I go back to Istanbul. Highly recommend this hotel. Pros: Staff, facilities, position . Cons: Front door bangs. We heard every arrival. Location: Right on the edge of Sultanahmet. Very short walk to Blue Mosque. Aya Sofia, Arasta market, cistern, and tramline. Nice variety of local restaurants We have the run of the place until other guests arrived, with resulting loud conversations outside our rooms and door knocking, banging doors etc not much the hotel can do about that, but did affect our stay. Staff were great. Rooms comfortable, facilities splendid. Local cats and dogs got vocal at night. Don't open your windows/doors. Just got back from a 4 night stay at the this lovely 'boutique' hotel in the old town part of Istanbul. 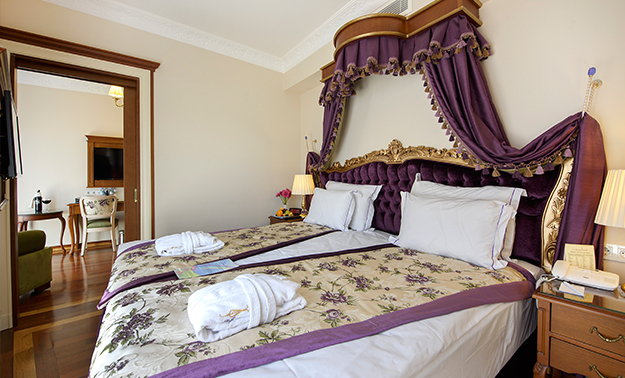 The location is perfect as only 10mins walk from the Ayia Sofia and Topkapi palace. 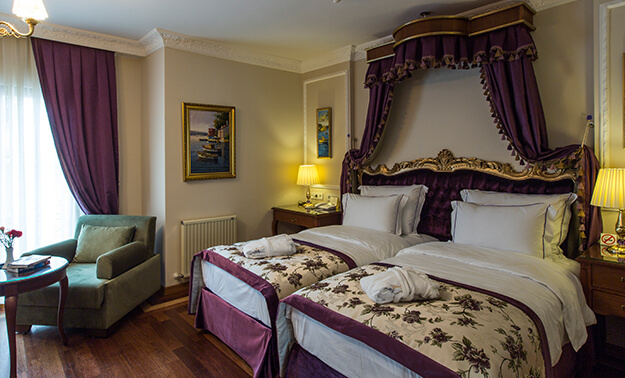 The hotel is a traditional mansion building that has been fully restored to a very high standard with beautiful interior décor. 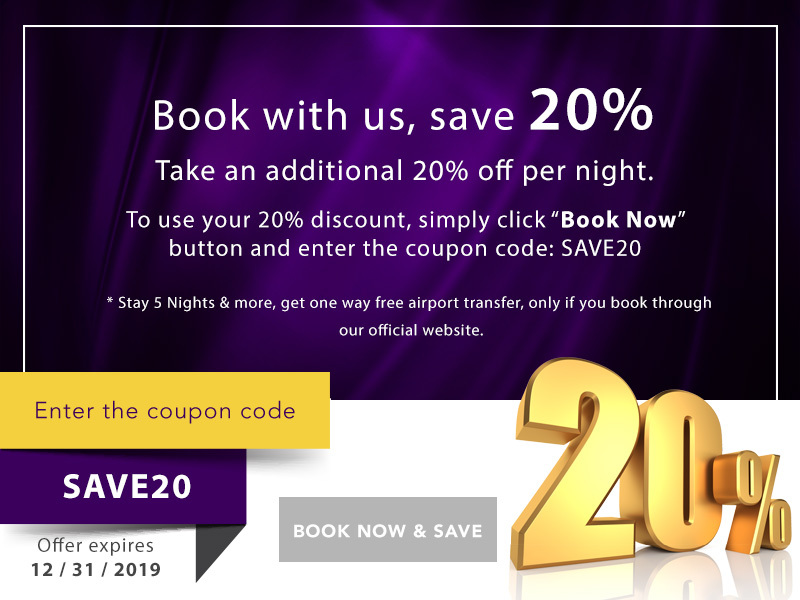 We enjoyed perfect nights sleeping in the super comfortable beds and fine cotton sheets, and there is modern air conditioning with fully independent temperature controls to escape the heat and humidity. The tea making facility was much appreciated. The ensuite bathroom in our 'junior' suite was well equipped including rainwater style shower and whirlpool bath, with quality marble finish everywhere. Hotel staff were all pleasant and very helpful, they even went and purchased special gluten free bread for my husband. Breakfast includes a big array of Turkish meze dishes as well as international buffet choices, and is available all morning. Only minor issue was our room size which was a little smaller than expected, and we didn't have enough drawer space for our clothes - partly because we were travelling with so many clothes as the holiday had been combined with a cruise. 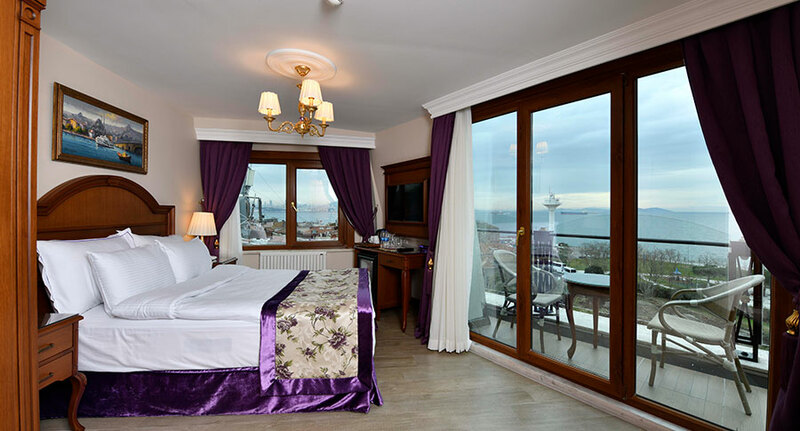 We think there are at least two bedrooms with sea views but we were not lucky enough to get one, so if/when we visit Istanbul we will definitely stay at this hotel again and request to reserve one. 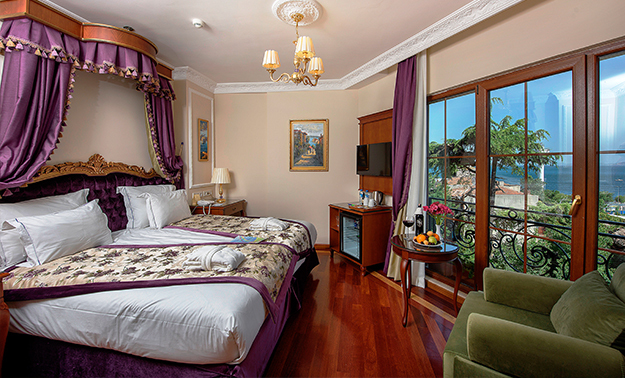 Sea Mansion Suites was an excellent bargain for a boutique (15 room) hotel in Sultanahmet. The location was very quiet and the room was clean and in good condition and had a partial water view. The staff was very friendly and tried to be helpful, but some of their recommendations were better than other (they got us a great guide but their restaurant suggestions weren't very good). Sultanahmet is the Old City where tourists want to be, but it was an uphill walk of several blocks to the tram and the main tourist attractions (Blue Mosque, Hagia Sophia and Topkapi Palace). The included buffet breakfast wasn't extensive but was very nice. The bed didn't have a top sheet, and although they provided one when we asked, they didn't seem to understand what we were talking about. 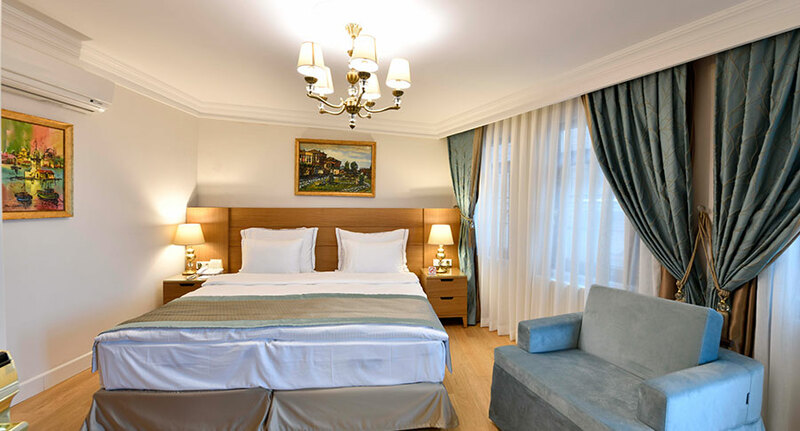 This luxury hotel comprises a total of 28 rooms spread over 4 storey and an Annex - located in the center of Sultanahmet, facing the Marmara Sea and the the Ruins of Bucaleon Palace .